The qmake tool helps simplify the build process for development projects across different platforms. qmake automates the generation of makefiles so that only a few lines of information are needed to create each makefile. 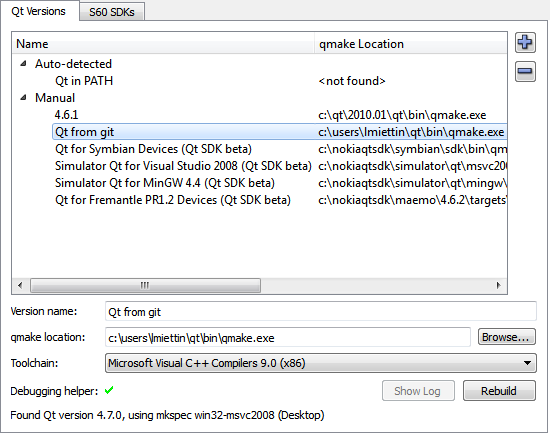 qmake can be used for any software project, whether it is written in Qt or not. The qmake tool generates a makefile based on the information in a project file that is generated by Qt Creator. It can generate makefiles for MinGW, Microsoft Visual studio, and CSL ARM in Windows, and GNU Compiler Collection (GCC) in Linux and Mac OS X. For more information about qmake, see the qmake Manual. Qt Creator allows you to have multiple versions of Qt installed on your development PC and use different versions for each of your projects. 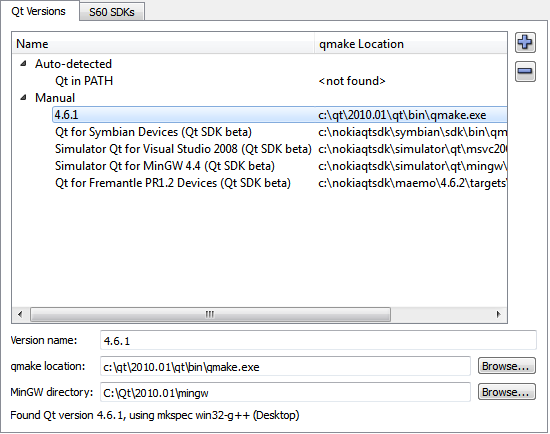 If Qt Creator finds qmake in the PATH environment variable, it uses that version. 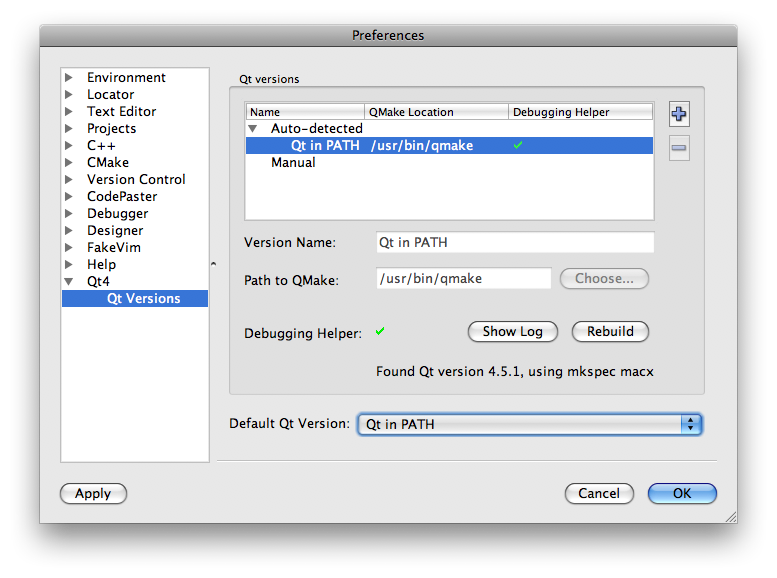 The qmake version of Qt is referred to as Qt in PATH. If you intend to use only one version of Qt and it is already in the PATH and correctly set up for command line use, you do not need to manually configure your Qt version. Select Tools > Options... > Qt4 > Qt Versions. Click and enter the name of the version in Version Name field. Enter the qmake binary path in the qmake Location. Enter the MinGW installation path in the MinGW Directory. Qt Creator automatically sets the correct environment variables for compilation. Select the internal version number of the installed Microsoft Visual C++ tool chain in the Toolchain list. 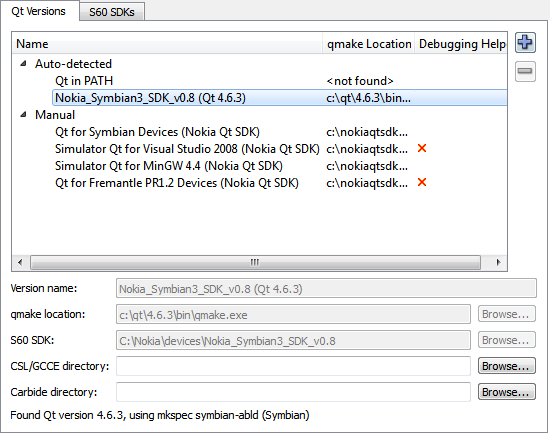 Select the S60 SDK you want the Qt Creator to use. To build an application for your device using GCCE, enter the path to the CSL ARM Toolchain directory in CSL\GCCE Directory. You do not need to specify this path if the compiler is included in the PATH environment variable. To build an application for the emulator (WINSCW toolchain), enter the path to your Carbide C++ installation directory in Carbide directory. Note: You need to have Carbide C++ version 2.0 or later installed. To compile a project in Qt Creator, Linux uses GNU Compiler Collection (GCC). Intel Compiler Collection (ICC) is supported as a drop-in replacement for GCC. Click and enter the name of the version in Version Name. Enter the path to the qmake binary in Path to qmake. To compile a project in Qt Creator, Mac OS X uses GNU Compiler Collection (GCC), which is part of Xcode. Select Qt Creator > Preferences... > Qt Versions. Through external libraries Qt Creator can support code completion and syntax highlighting as if they were part of the current project or the Qt library. Open your project file (.pro) using the Projects pane. Follow the instructions at Declaring other Libraries. Syntax completion and highlighting work once your project successfully builds and links against the external library.